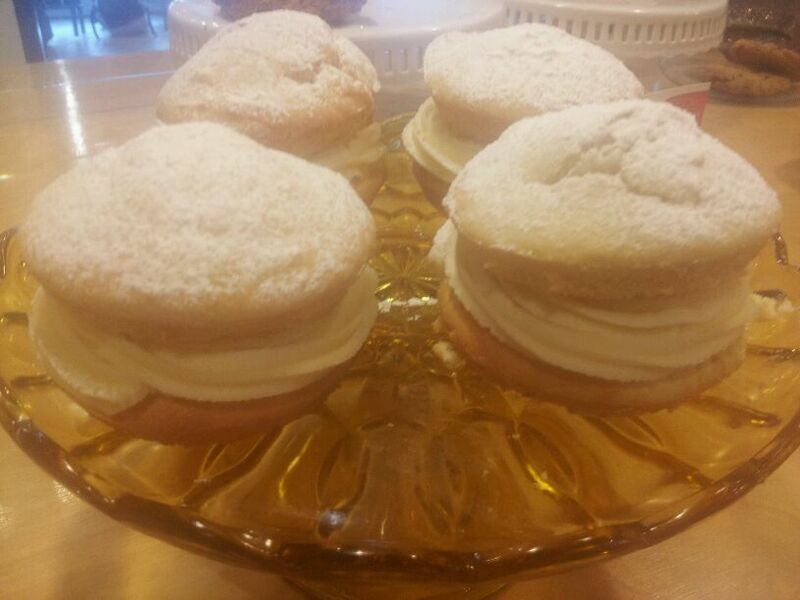 Here is a pastry you do not come across home-made very often: whoopie pies. They are similar to cupcakes, but rather than the frosting on top, it is sandwiched between two pieces of cake, and the cake has the consistency of a soft cookie and a cake combined. In my opinion, they are heavenly. While at work yesterday, there was an opportunity to experiment with a recipe, so I chose to make Vanilla Dream whoopie pies from the cookbook Whoopie Pies by Hannah Miles. I greased two whoopie pie pans (it should be 24 cavities in total, making 12 pies. I originally thought that each cake would get cut in half, so I ended up filling 18 cavities), and set them aside. Using an electric mixer, I creamed the butter and sugar together until fluffy, then added the egg and vanilla and beat the mixture some more. Then, I added the dry ingredients with the buttermilk and sour cream and blended until just combined. I finished by adding the hot water. Next, I scooped the batter into the prepared pans, and left them to stand for 10 minutes. Then, I baked the cakes for 10-12 minutes at 350 degrees Fahrenheit. For the vanilla butter cream, I used a batch of vanilla frosting that was already made, but here is the recipe from the book. Cream the butter until light and fluffy, then add icing sugar little by little. Add the milk and vanilla and whip until smooth. Once the cakes were removed from the oven, I let them sit for about ten minutes, then carefully unmolded them. I let them cool completely, then piped the frosting on top of half of them, and lidded them with another cake. I finished them off by sifting some icing sugar on top. The recipe also directed to put some raspberry preserve on top of the frosting, but we did not have any at work. What I loved about the whoopie pies was that with each bite there was a perfect balance of cake and frosting, unlike cupcakes, in which you can get a mouthful of just icing, or a mouthful of just cake. I also found the cake to be lighter than a cupcake, but maybe this would be different if I had actually used self-rising flour. Overall, it was fun to make, and it was even more exciting when all but one sold within an hour and a half! As the days get closer and closer to my departure to Argentina, I am unsure about how much more I will get to post about recipes I make until after I get back. I plan on posting about my trip, so this could temporarily turn into a travel blog about growing vegetables. I will also most certainly post about the food I am eating. Wish I could have had one!